Toxoplasmosis is an important zoonosis, being a cause of congenital disease and abortion in animals and humans. DNA vaccination as a promising vaccine remains a challenge for an improved delivery system. 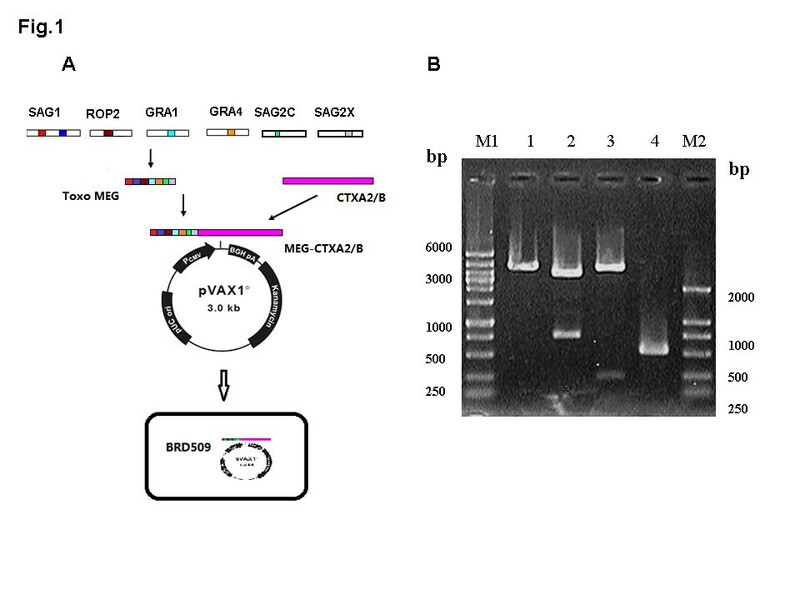 In this study, attenuated Salmonella typhimurium BRD509 was used to deliver a DNA vaccine encoding several epitopes, derived from the tachyzoite proteins SAG1, GRA1, ROP2, GRA4 and bradyzoite proteins SAG2C, SAG2X of Toxoplasma gondii and A2/B subunit of cholera toxin. The recombinant plasmids were electroporated into attenuated Salmonella typhimurium. Humoral and cellular immune responses were evaluated for BALB/c mice administered with this attenuated recombinant Salmonella vaccine via the oral and nasal route or by intramuscular injection with DNA plasmid directly. High IgG levels were present in the mice immunized intramuscularly, while IgA levels were higher in the oral and nasal immunization groups. Furthermore, cellular immunity was activated in oral immunization groups with 60% survival rate following challenge with high virulent RH strain. The results from this study indicate that a DNA vaccine encoding multi-epitopes of T. gondii delivered by attenuated Salmonella is promising. Toxoplasma gondii is a single-cell obligate intracellular protozoan, which is widely prevalent in humans and animals[1, 2]. This parasite is of major medical and veterinary importance, being a cause of congenital disease and abortion[3, 4]. Despite many efforts and significant advances in the understanding of the immune responses that occur after infection by T. gondii, animal experiments have shown that the effect of monovalent antigen vaccine is not ideal[5–7]. Therefore, the development of a variety of antigen combinations for different stages of life cycle, especially epitopes from tachyzoites and bradyzoites are likely to be needed for full protection[8–11]. We constructed a DNA vaccine encoding five epitopes of T. gondii previously. The vaccination injected intramuscularly into BALB/c resulted in an improvement of the humoral and cellular immune response in immunized mice, but there was only 20% survival rate achieved in vaccinated mice. In order to broaden the immunogenicity, we intend to include more epitopes from various proteins of tachyzoites and bradyzoites in the vaccine construction. Other than epitopes from tachyzoite proteins SAG1, GRA1, ROP2, GRA4, epitopes from bradyzoite proteins SAG2C, SAG2X were also included[13, 14]. However, DNA vaccines have been used to inject intramuscularly as naked DNA using a gene gun and by subcutaneous inoculation. After vaccination, only a limited amount of DNA reaches professional APCs cells. Mechanisms to induce a more effective immune response and to improve protection from immunized mice remains to be determined. Recombinant Salmonella have been used as vaccine vectors to deliver both DNA and protein vaccines from a wide variety of bacterial, viral and parasitic sources[16, 17]. Attenuation virulence bacteria, which can penetrate host cells delivering vaccine antigen to APCs, can be used effectively to transport immunogens[18, 19]. In this study, a recombinant attenuated Salmonella DNA vaccine encoding multi-epitopes of T. gondii and A2/B subunits of cholera toxin was constructed. The immunity induced by this attenuated recombinant Salmonella vaccine administered orally and nasally in BALB/c mice was compared to immunity induced by a plasmid DNA vaccine injected into mice intramuscularly. Protection against challenge with high virulent RH strain of T. gondii was evaluated. Tachyzoites of the high virulent RH strain of T. gondii were cryopreserved in our laboratory. Parasites were maintained by serial intraperitoneal passage in BALB/c mice. Tachyzoites were harvested from the peritoneal fluid of mice after 72 h, and used to challenge immunized mice. Salmonella typhimurium strain BRD509 is an aroA- and aroD- mutant of SL 1344. This was kindly provided by Dr. Jifeng Bian, the Department of Molecular Biology, Shandong University. The oligonucleotides of multi-epitope genes (MEG) were designed based on the T. gondii peptide sequences: SAG1-I 59–67 (TCPDKKSTA), SAG1-II 246–255 (ILPKLTENPW), GRA1 176–186(DTMKSMQRDED), ROP2 200–215 (GDVVIEELFNRIPETS), GRA4 235–243 (SGLTGVKDS), SAG2C 36–44 (SQFLSLSLL), SAG2X 215–223 (AAGTTATAV). The construction of pVAX1-MEG-CTXA2/B was shown in Figure 1. Construction of recombinant attenuated Salmonella carrying pVAX1-MEG-CTXA 2 /B plasmid encoding multi-epitope genes derived from T. gondii and A 2 /B subunits of cholera toxin. (A) The diagram of the construction of recombinant attenuated Salmonella. (B) Gel electrophoresis analysis of pVAX1-MEG-CTXA2/B plasmid encoding multi-epitope genes of Toxoplasma gondii. Lane M1: DNA Marker D, L 100 + 6000, Lane M2: DNA Marker DL2000, Lane1: pVAX1-MEG-CTXA2/B plasmid digested by EcoR I, Lane 2: pVAX1-MEG-CTXA2/B plasmid digested by Hind III and EcoR I, Lane 3: pVAX1-MEG-CTXA2/B digested by Hind III and Kpn I, Lane4: PCR product of CTXA2/B. Attenuated recombinant Salmonella carrying pVAX1-MEG-CTXA2/B was generated by electroporation. pVAX1-MEG-CTXA2/B plasmid was transferred into 100 μl competent S. typhimurium BRD509 in the condition of 2.5 kV, 25 uF, 5 ms. To produce inocula, recombinant Salmonella were incubated overnight at 37°C until an OD600 of 0.8 was reached, then washed and resuspended in PBS to a final density of approximately 1–5 × 109 cfu. SPF BALB/c female mice (6–8 weeks old) were used in the immunization and parasite challenge. They were purchased from The Laboratory Animal Center of Shandong University. All studies were conducted with Animal Care and Use Committee of Shandong University approval. The mice were randomly divided into intraoral, intranasal and intramuscular immunization groups (30 mice per group). Table 1 summarizes the treatments performed in the mice. Mice were vaccinated three times at 2 weeks intervals. Blood was collected by orbital plexus puncture and sera were stored at -70 °C for further analysis. 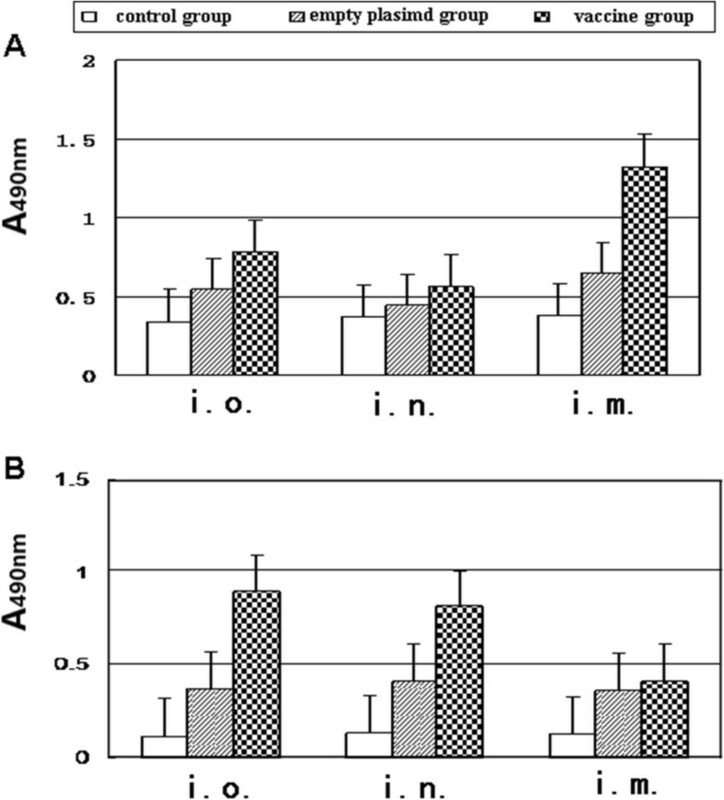 aThe mice were randomly divided into intramuscular, intranasal and intraoral immunization groups (30 mice per group). For the intramuscular group, the mice were injected 100 μl 1 μg/μl recombinant plasmid or empty plasmid in the quadriceps muscle; For the nasal group, each mouse was given a nasal drip of 50 μl 109 cfu/ml Salmonella bacteria with recombinant plasmid or empty plasmid; The oral group was administrated 200 μl 109 cfu / ml Salmonella bacteria with recombinant plasmid or empty plasmid orally; Each group also had 10 mice which were treated with Salmonella without plasmid or saline as negative control. Mice were vaccinated three times at 2 week intervals. bHumoral immunity (HI) was tested by collecting sera from three immunized mice in each group. cCellular immunity (CMI) was evaluated by splenocytes from three immunized mice per group 2 weeks after the last immunization. dFour weeks after the last immunization, immunized mice were challenged intraperitoneally with 1 × 103 tachyzoites of T. gondii RH strain. For challenge study, immunized mice were challenged intraperitoneally with 1 × 103 tachyzoites of RH strain T. gondii 4 weeks after the last immunization. The survival time and the survival rate was measured. To measure T. gondii-specific total IgG and IgA, plates (Dursley, UK) were coated with 10 ug/ml solution of STAg at 4°C overnight. Sera were diluted in 1% PBST-20 (1:100) and incubated in the plates for 1 h at room temperature (RT). After washing the plates, Horseradish peroxidase (HRP)-conjugated goat anti-mouse IgG, IgA (SouthernBiotech, USA) were further incubated for 1 h at RT. Peroxidase activity was revealed by 3,3′,5,5′- tetramethylbenzidine (TMB, 10 mg/ml) and stopped by adding 50 μl of 2 M H2SO4. The optical density (OD) was read out at 450 nm in a microplate reader (Bio-TEK, USA). Spleens from three immunized mice per group were removed 2 weeks after the last immunization. The splenocytes were adjusted to a concentration of 5 × 106 cells/ml in DMEM with 10% FCS. The suspension of 100 μl in each well was cultured with STAg (10 μg/ml), purified rMEG protein (50 μg/ml) or concanavalin A (Con A, 5 μg/ml; Sigma). Cell proliferative activity was measured according to instructions described in a previous study. Cells were stained with FITC-labeled anti-mouse CD8+ monoclonal antibody and PE-labeled anti-mouse CD4+ monoclonal antibody, T lymphocyte subsets were measured using flow cytometry (Beckman Coulter, USA). Splenocytes from immunized mice were cultured with rMEG protein as described for lymphocyte proliferation assays. Commercial ELISA kits (mouse IL-4 OptEIA, IL-5 OptEIA, IFN-γ OptEIA, IL-2 OptEIA, Endogen, USA) were used according to the manufacturer’s instructions to assay cytokine levels in culture supernatants obtained at 24 h for IL-4, at 36 h for IL-5, at 72 h for IL-2 and at 96 h for IFN-γ. The statistically significant differences between groups were calculated with one-factor analysis of variance (ANOVA). Differences were considered to be significant with p < 0.05. The diagram for multi-epitope DNA vaccine of T. gondii is shown on Figure 1A. Recombinant Salmonella carrying pVAX1-MEG-CTXA2/B plasmid were identified by enzyme digestion, by PCR (Figure 1B) and further confirmed by sequencing. IgG antibody levels in mouse serum indicates that pVAX1-MEG-CTXA2/B DNA plasmid inoculated intramuscularly induced higher levels of IgG than mice immunized with BRD509/pVAX1-MEG-CTXA2/B orally and intranasally, p < 0.05 (Figure 2A). On the other hand, higher levels of anti-T. gondii IgA were detected in the serum of mice immunized with BRD509/pVAX1-MEG-CTXA2/B via the oral and nasal route than in the serum of mice injected intramuscularly with pVAX1-MEG-CTXA2/B plasmid (p < 0.05) (Figure 2B). Specific humoral response to native T. gondii antigens in mice immunized with multi-epitope DNA vaccine was measured using ELISA 2 weeks after the last immunization. (A) Total Anti-T. gondii IgG; (B) Anti-T. gondii IgA were tested by sera diluted 1:200 from BALB/c mice via three different immunized routes: i.o. ( intraoral); i.n. (intranasal); i.m. (intramuscular). CD4+ and CD8+ T lymphocyte subsets in immunized mice were assayed by flow cytometry. Table 2 shows the percentage of CD4+ and CD8+ T-cell. The percentage of CD8+ T cells in mice immunized intramuscularly with pVAX1-MEG-CTXA2/B plasmid was 28.54 ± 0.92%. A even higher percentage of CD8+ T cells, 30.01 ± 1.78%, was achieved in mice immunized intranasally with BRD509/ pVAX1-MEG-CTXA2/B. The highest percentage of CD8+ T-cell, 35.55 ± 0.70%, was achieved in mice immunized orally with BRD509/pVAX1-MEG-CTXA2/B (Table 2). Culture supernatants from antigen-stimulated splenocytes from mice in these groups were quantified with sandwich ELISA for Th1 and Th2 cytokines. As shown in Table 3, culture supernatant cytokines from the mice vaccinated intramuscularly with pVAX1-MEG- CTXA2/B demonstrated preferential production of IFN-γ and IL-2, which were significantly higher than that of control groups (p < 0.05). The amounts of IFN-γ and IL-2 were significantly higher in the mice via oral and intranasal immunization with recombinant Salmonella BRD509 than the mice immunized intramuscularly (p = 0.02). However, the levels of IL-4 and IL-5 produced by immunized mice were low, and no statistically significant differences were present between vaccinated groups and control groups (p > 0.05). Furthermore, antigen specific lymphocyte proliferation activity was highly enhanced for BRD509/pVAX1-MEG-CTXA2/B oral and intranasal immunization groups than for the pVAX1-MEG-CTXA2/B intramuscular immunization group (p < 0.05). aMice were immunized by three immunization routes, intramuscular, intraoral, intranasal, on day 0 and day 14 and day 28 with different immunization regimens. bThe splenocyte culture supernatants taken from mice (n = 3, each group) 2 weeks after the last immunization were stained with FITC-labeled anti-mouse CD8+ monoclonal antibody and PE-labeled anti-mouse CD4+ monoclonal antibody, T lymphocyte subsets were measured using flow cytometry. aMice were immunized by three immunization routes, intramuscular, intraoral, intranasal on day 0 and day 14 and day 28 with different immunization regimens. bThe splenocyte culture supernatants taken from mice (n = 3, each group) 2 weeks after the last immunization were examined for cytokine production by sandwich ELISA obtained at 24 h for IL-4, at 36 h for IL-5, at 72 h for IL-2 and 96 h for IFN-γ. cThe results of proliferation assays are expressed as the stimulation index (SI), calculated as the ratio between the mean counts per minute (cpm) for triplicate stimulated cultures and the mean counts per min for triplicate unstimulated cultures. SI values 2.5-fold greater than the SI of the control groups were considered as significant. Four weeks after the last immunization, mice were challenged with 100 ul 1 × 103 tachyzoites of T. gondii RH strain intraperitoneally. All the control mice died. Mice treated with saline died within 4 days. Mice immunized with empty plasmid intramuscularly died within 5 days. Mice treated orally with empty Salmonella died within 8 days. While there was a 20% survival rate (2/10) for the mice immunized with pVAX1-MEG-CTXA2/B plasmid intramuscularly. The recombinant Salmonella BRD509/pVAX1-MEG-CTXA2/B intranasal immunization group had 40% survival rate (4/10) after 10 days. 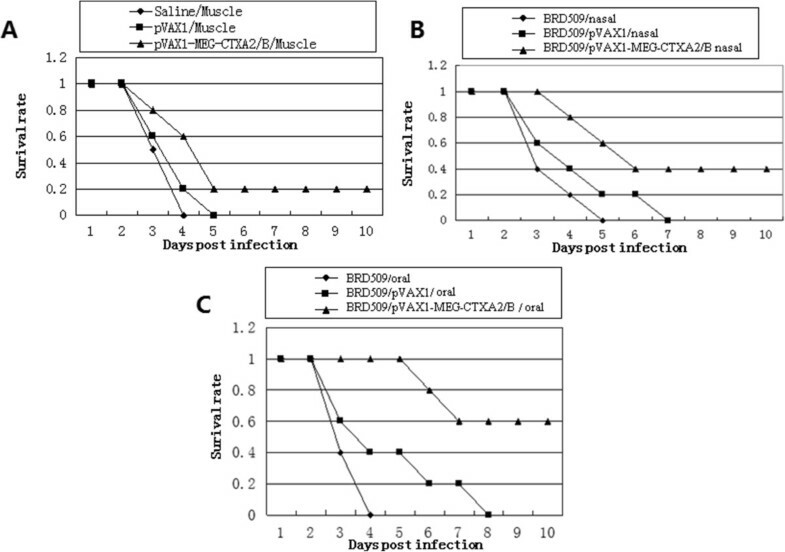 The highest survival rate of 60% (6/10) was achieved in the mice orally immunized with recombinant Salmonella BRD509/pVAX1-MEG-CTXA2/B (Figure 3). Survival curves of immunized mice after challenge with 10 3 tachyzoite forms of RH T. gondii strain 4 weeks after the last immunization. (A) Intramuscular immunization group, the mice were injected with 100 μl 1 μg/μl recombinant plasmid, empty plasmid or PBS in the quadriceps muscle; (B) Nasal immunization group, each mouse was given a nasal drip of 50 μl 109 cfu/ml Salmonella bacteria with recombinant plasmid, empty plasmid or empty bacteria; (C) Oral immunization group, the mice were administrated orally with 200 μl 109 cfu/ml Salmonella bacteria with recombinant plasmid, empty plasmid, or empty bacteria. Recently, considerable efforts have been devoted to the development of nucleic acid vaccine to protect against T. gondii[22–25]. However, because of the complexity of the parasite life cycle and the variability of the parasite antigens, multi-epitope vaccines have become an attractive strategy for development of vaccines against this parasite[26–28]. In this study, a DNA vaccine encoding seven epitopes of T. gondii, derived from the tachyzoite proteins SAG1, GRA1, ROP2, GRA4 and bradyzoite proteins SAG2C, SAG2X of T. gondii, were constructed and linked to A2/B subunit of cholera toxin. However, DNA vaccine as a promising vaccine remains a challenge for an improved delivery system. Mucosal vaccines can enhance mucosal and systemic humoral immunity especially for intracellular parasites such as T. gondii[29, 30]. Thus, the best way for a vaccine to induce mucosal immunity is directly by inoculation of the mucosal surface. In this study, attenuated strains of S. typhimurium BRD509 were used as vaccine vectors to deliver heterologous antigens to the mucosal surface of the vaccine recipients[31, 32]. A recombinant attenuated S. typhimurium vaccine encoding a multi-epitope gene of T. gondii was constructed. The mice were given inoculations via oral, nasal, or muscular routes. Immune responses induced by oral or nasal immunization with attenuated recombinant Salmonella BRD509 vaccines were compared to immune response induced by immunization with the plasmid pVAX1-MEG-CTXA2/B DNA vaccine intramuscularly. The results showed intramuscular immunization of mice induced higher levels of IgG antibodies than attenuated recombinant Salmonella vaccine immunization via oral and nasal routes. However, the attenuated recombinant Salmonella oral and intranasal immunization induced higher levels of IgA antibodies than intramuscular immunization. IgA is important in mucosal immunity to oral infection with toxoplasma cysts. Since antibodies of this isotype are important in preventing re-infection with T. gondii, inducing IgA may be a major strategic aspect of vaccine development[33, 34]. Major mechanisms by which immunocompetent hosts control T. gondii infections is thought to be the strong and persistent cell-mediated immunity elicited by parasites[35, 36]. In this study, splenocyte proliferation was enhanced in mice immunized by all three routes. Proliferation activity was significantly enhanced in mice immunized with recombinant attenuated Salmonella BRD509 via oral and nasal routes. Both CD4+ and CD8+ T cell subsets play a central role in the establishment of protective immunity in hosts. In this study, CD4+ and CD8 + T lymphocytes subsets from immunized mice were assayed by flow cytometry. There was a marked increase in the percentage of CD8+ T-cells in mice immunized with the recombinant attenuated Salmonella BRD509 vaccine perorally. As we know, the memory T-cell consists of CD4+ and CD8+ T-cells, which can rapidly acquire effector functions to kill infected cells and secrete inflammatory cytokines that inhibit replication of the pathogen. Effector CD4+ T-cells enhance CD8+ T cells develope and help B-cell responses through the activation of antigen-presenting cells or the secretion of cytokines, such as IFN-γ, IL-2[37, 38]. Compared with the intramuscular immunization DNA vaccine, introduction of attenuated Salmonella further enhanced Th1 cell-mediated immunity with higher levels of IFN-γ and IL-2 but low levels of IL-4 and IL-5. These results clearly demonstrate that attenuated Salmonella BRD509 can significantly augment Th1-type cellular immune responses in BALB/c mice. Both T-cell subsets are important sources of IFN-γ. Optimal protective CD8+ T cell responses depend on the ability of CD4+ T-cells to provide the growth factor IL-2. In this study, a highly virulent RH strain of T. gondii was used for challenge study. When challenged with lethal doses of T. gondii (1 × 103) all three immunization groups prolonged survival time compared to control mice. Especially, mice immunized perorally had a 60% survival rate. There was somewhat less enhancement of survival (40%) following intranasal immunization, while only a 20% survival rate was achieved following intramuscular immunization. In the future, a cyst-forming PRU strain of T. gondii will be used to evaluate the protective potency of this recombinant Salmonella vaccine via the mucosal immunization route. In summary, multi-epitope vaccines delivered by attenuated Salmonella are a promising way to elicit protective immune responses. Compared to intramuscular injection, oral and nasal immunizations with recombinant Salmonella elicits both systemic and mucosal immune responses, accompanied by a significant increase in survival rates in vaccinated mice after challenge with highly virulent parasites. The results from this study should contribute to development of highly protective mucosal vaccines against T. gondii. This study was supported by grants from the National Natural Science Foundation Project of China (Grant No. 81171604, No. 81271857 and No. 31170906) and China Postdoctoral Science Foundation (Grant No. 20110491573). HC carried out the vaccine construction and drafted the manuscript. XZ performed the immune response analysis. XZ and LZ performed the animal experiments. QY and ZW participated in the design of the study. QY performed the statistical analysis. YZ and SH made a revision of the manuscript. All authors have read and approved the final manuscript.